With very little public awareness and no study of environmental impacts, the oil industry has made the Hudson Valley into one arm of a dangerous “virtual pipeline” for crude oil that snakes thousands of miles by rail, barge and ship from oil fields in North Dakota, Canada and elsewhere, to refineries on both coasts. 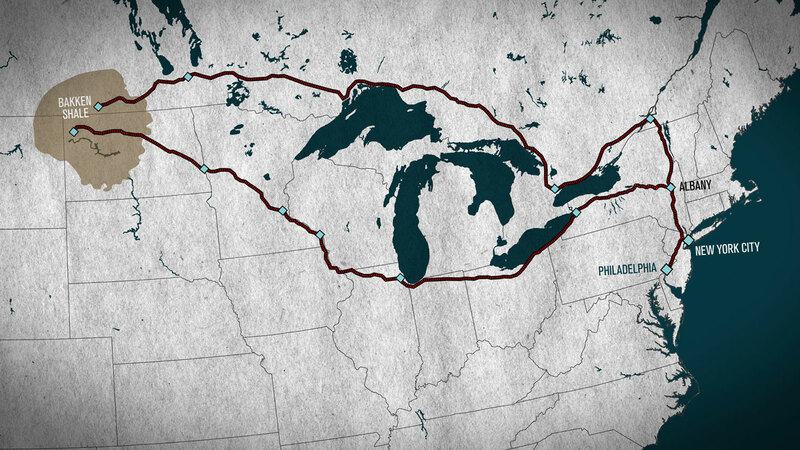 The New York State segment of this “virtual pipeline” primarily moves a particularly volatile crude oil by rail from the Bakken shale formation of North Dakota and nearby states and provinces, where oil production has doubled in three years, to the Port of Albany. There, billions of gallons of crude oil can be offloaded onto barges and ships destined for East Coast refineries. Additional trains loaded with crude oil destined for refineries to the south continue along the west side of the Hudson River, through communities in Greene, Ulster, Orange and Rockland counties. Some of these trains carry Canadian tar sands crude bitumen, and there are proposals that would facilitate the shipment of heavy crudes like this by barge as well. Now, there is a proposal to build two massive pipelines called the “Pilgrim Pipeline” from Albany, NY to the Linden, NJ area. One pipeline is proposed to carry crude oil south, and the other proposed to bring refined petroleum products north. Learn more about the risks of this proposal below. The potential human and environmental impacts of this “virtual pipeline” are anything but virtual. The Hudson River, its tributaries and every community along the river or the freight rail line are at risk from spills and fires. The expansions at oil terminals in the Port of Albany operated by Global Partners and Buckeye Partners were approved starting in 2011, before many concerns about crude oil shipments came to light, with minimal public awareness, and with no study of environmental impacts. Until late 2011, there was no crude oil being transported on the Hudson River, and the amount of crude oil being transported on the river has quickly grown to a permitted volume of 2.8 billion gallons per year. Global Partners has proposed expanding or building oil terminal and rail transloading facilities in Albany and New Windsor (defeated) that would facilitate the transfer of additional crude oil, and add heavy crude oil to the products being transported on the river. Buckeye Partners is also building infrastructure to support the transfer of heavy Canadian tar sands oils to its facility in the Bahamas. A typical articulated barge can carry roughly 4 million gallons of crude oil. The Afrodite, the ship previously making regular trips on the Hudson, can carry 8.4 million gallons. In December 2012, the first ship to leave the Port of Albany, the Stena Primorsk, ran aground about 6miles from the Port of Albany. Fortunately, a double hull kept its 12 million gallons of crude oil—about the same amount spilled by the Exxon Valdez—from spilling into the shallow waters near Schodack Island. The hull ruptured in an area that is prime shad and herring spawning habitat, and noted for the abundance of shorebirds, wading birds and waterfowl—a state-designated significant habitat deemed irreplaceable”. See a list of relevant barge and tanker accidents. While the Hudson River has long been part of shipping routes for other petroleum products, like heating fuel and gasoline, crude oil poses a new risk due to its characteristics as a pollutant and the massive volume being transported. Spill response plans have not been developed to respond adequately to spills of crude oil in all parts of the Hudson River. Spills of heavy crude oil can be particularly devastating, since the tar-like oil will likely sink, rather than float, making cleanup difficult or impossible. The success of spill response has to date not been measured by the amount of oil recovered after a spill, with recovery rates of just 5% or less common, and it is expected that the Hudson’s tides, currents and turbidity would make recovery particularly difficult. The Hudson River is the source of drinking water to more than 100,000 residents of the Mid Hudson Valley, including people living in Poughkeepsie, Highland, Port Ewen, Hyde Park and Rhinebeck. The Hudson is a designated National Heritage Area, the backbone of the region’s $4.7 billion tourism economy, and a public beach and recreational resource for millions of people. 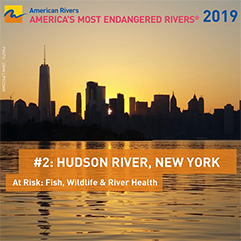 The Hudson River estuary supports more than 200 species of fish, including endangered species, and each stretch of the river provides unique habitats—including 40 state-designated significant wildlife habitats—essential for fish and other wildlife. Critical infrastructure, including water and sewer plants, as well as public parks, homes and businesses on the waterfront are at risk from a spill. Major industrial facilities, including several power plants, draw water from the Hudson. Nationwide, shipping crude oil by rail has jumped sixfold since 2011, according to American Association of Railroads data, and rail shipments from the Bakken region have increased exponentially since 2009. In 2013, far more oil was spilled from rail accidents in the U.S.—more than 1.15 million gallons—than in the previous four decades, combined. 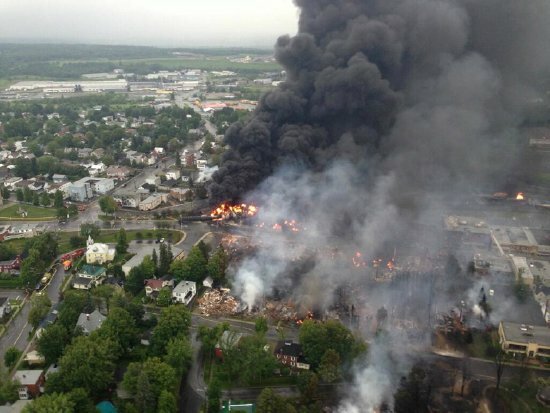 The factors common to train derailments include a vast increase in traffic of heavy, fully loaded “unit trains” made up of about 100 tanker cars linked end to end, each car holding approximately 30,000 gallons of crude oil. Both the particular type of crude oil and the particular train cars used pose risks. As of mid-2014, two to four unit trains per day, each carrying roughly 3 million gallons travel through parts of New York State. Oil destined for Albany transloading terminals is carried from the North on Canadian Pacific lines, and from the West on CSX lines through communities including Buffalo, Rochester, Syracuse, Dunkirk, Plattsburgh, Whitehall, Saratoga, Mechanicville, and Watervilet; and in close proximity to Lake Champlain, the upper Hudson River and the Mohawk River (the Hudson’s largest tributary). Much oil also continues south of Albany by rail along the Western side of the Hudson River. Rail companies disclosed the number of crude oil trains traversing New York only in 2014, but projects to expand Philadelphia-area refineries and the CSX railroad line between Albany and northern New Jersey suggest that this route came into use around the same time as the Port of Albany oil terminals were built out to transload crude oil. Crude oil trains traveling south of Albany pass through Hudson Valley communities including Ravena, Catskill, Lake Katrine, Kingston, Newburgh, Cornwall-on-Hudson, West Point, Stony Point, Haverstraw, Congers, Valley Cottage, West Nyack, Orangeburg and Tappan. The trains pass close to critical infrastructure, community resources, homes and businesses, and schools—each of which is a state-designated “significant habitat” The trains also pass by drinking water intakes on the Hudson River at Poughkeepsie, Highland and Hyde Park, and by Lake Deforest, a critical source of drinking water for Rockland County and some Northern New Jersey communities. Read our report created with Waterkeeper Alliance and Stand, “Deadly Crossings”, on the state of rail bridges in the United States. A permit application has been filed by Pilgrim Pipeline Holdings, LLC to the NYS Thruway Authority for two parallel pipelines each up to 20 inches in diameter that would run from Albany, NY to Linden, NJ. One pipeline would transport crude oil south while the other pipeline would carry refined products north. In total, the pipeline would cover some 170 miles, crossing Albany, Rensselaer, Greene, Ulster, Orange, and Rockland counties. 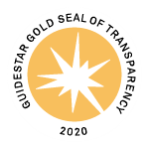 Please see our dedicated campaign page regarding the proposal for new Hudson River anchorage grounds here. Derived from the Bakken shale formation that underlies much of North Dakota and adjacent U.S. states and Canadian provinces, this crude oil has been accessed in recent years only as hydraulic fracturing (“fracking”) has made it economical. The Bakken shale formation is now a major U.S. oil field producing millions of gallons of crude oil per day. This crude oil is light and highly volatile. When spilled it poses an immediate risk of catastrophic fire and explosion, as well as significant risks of air pollution. It would likely float if spilled in water, disperse quickly and coat shorelines. Derived primarily from the Alberta tar sands region in western Canada, this crude oil has a consistency that has been compared to peanut butter. Difficult to transfer without dilution or heating, this heavy crude oil also poses a significant risk to water because it will sink, rather than float. Tar sands can be diluted with lighter petroleum products, including kerosene and Bakken crude oil, for transport via rail or pipeline. The risks posed by spills of diluted bitumen aren’t fully known, but may include the worst of both. We are researching all aspects of the “virtual pipeline” and executing a multifaceted strategy to reduce or eliminate the risks to the Hudson and our communities. Our campaign includes work on Hudson River crude oil terminals, crude oil train safety, pipelines, oil spill response and recovery, local government engagement and public outreach. You, too, can make a difference. Visit our action center to take action today!